The Frank Worrell Trophy is awarded to the winner of the West Indies–Australia Test match series in cricket. The trophy is named after Frank Worrell who was the first black captain of the West Indies. It was first awarded at the end of the 1960–61 series in Australia, the first Test of which ended in a tie. The Australian Cricket Board of Control and Don Bradman commissioned former Test cricketer and professional jeweller Ernie McCormick to create a perpetual trophy following the tie. The trophy's design incorporated a ball used in the tied Test. As of 2019[update], Australia hold the trophy following their 2–0 series victory in the West Indies 2015–16 tour. Australia also lead in overall wins, winning 14 of the 24 series, while the West Indies have won 8, the remaining 2 ending in draws (with the trophy being retained by the incumbents). Brian Lara is the most successful batsman in the history of the trophy, scoring 2,815 runs for the West Indies in 56 innings at an average of 52.12. He also holds the record for the highest score (277) which he made in the third Test at the Sydney Cricket Ground during the 1992–93 series. West Indian fast bowler Courtney Walsh has taken the most wickets in the trophy, with 135 over 38 matches, at an average of 28.68, while Australia's Graham McKenzie has the best bowling figures of 8 wickets for 71 runs, achieved in the second Test of the 1968–69 series. 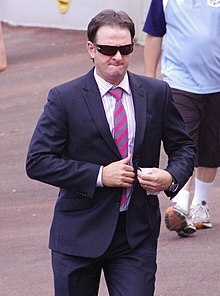 Australian Mark Waugh has taken the most catches, with 45 in 28 matches, while West Indian Jeff Dujon is the most successful wicketkeeper, making 84 dismissals in 23 matches. Frank Worrell became the first black captain of the West Indies cricket team prior to their 1960–61 tour of Australia. The first Test of the five-match series ended in a tie, the first in the history of Test cricket. Don Bradman remarked to Australia captain Richie Benaud, "That is the greatest thing that's ever happened to the game". Evelyn Wellings described the Test as "the Greatest Test Match, the Greatest Cricket Match and surely the Greatest Game ever played with a ball". Despite that setback, with Benaud claiming the Australians had "thrown away a match", they went on to win the series 2–1 with one drawn Test. Former cricketer and journalist Johnny Moyes declared the series to be "the most wonderful cricket tour Australia has known". The West Indies team received acclaim for their performances, the whole series was played in a convivial manner, and the Australians, suitably impressed by Worrell, named the trophy after him. Winning the first and third Tests of the 1964–65 series, the West Indians took the trophy to the Caribbean for the first time. The following three series were all won by Australia, with the 1975–76 series ending 5–1. The West Indies sole Test victory in the latter series, at the WACA Ground in Perth, was by an innings and 87 runs. It featured an explosive innings from West Indian batsman Roy Fredericks who struck 169 from 145 deliveries and was described by former batsman Lindsay Hassett as the "greatest innings I've seen in Australia". The 1977–78 series saw the beginning of fifteen years of West Indian dominance in the trophy, but it was not without controversy. The first two Tests of that series were completed within three days, the second being notable for Graham Yallop becoming the first batsman to wear a helmet at the crease. With the West Indies team departing to join Kerry Packer's World Series Cricket as the World Series Cricket West Indies XI, Australia managed a victory against the second-string team in the third Test but were beaten by 198 runs in the fourth. The final Test saw the West Indies eight wickets down with more than 100 runs needed when Vanburn Holder was dismissed. Although the decision was legitimate, Holder's reaction on the way back to the pavilion was interpreted otherwise, and the Jamaican crowds began to riot. The match was abandoned, and with two of the three umpires refusing to consider a sixth day's play, the result was declared a draw. The 1981–82 series was drawn overall, with one victory each and one draw, thus the West Indies retained the trophy. Courtney Walsh is the tournament's leading wicket-taker. After drawing the first two Tests of the 1983–84 series, the West Indies swept the Australians aside, winning the remaining Tests, two by ten wickets and one by an innings and 36 runs. They continued their good form in the following series in Australia, with dominant wins in the first three Tests, losing the final Test (a dead rubber at that point) to secure the trophy with a 3–1 victory. The West Indies were consistently superior over the next three series, winning seven Test matches to Australia's three, thereby holding the Frank Worrell Trophy from 1978 to 1993. The final and deciding Test of the 1992–93 series saw Curtly Ambrose take seven wickets for one run in 32 deliveries, reducing Australia from 85 for 2 to 119 all out. For the 1994–95 series, the West Indies brought in a new coach and a new manager. Despite a fourth wicket stand of 124 between Brian Lara and Carl Hooper after the West Indies had been reduced to 6 runs for 3 wickets, Australia secured a ten-wicket victory inside three days. A draw in the second Test was followed by a nine-wicket victory for the West Indies in the third. The fourth and final Test was later referred to as "make or break for both teams" by the Australian bowler Paul Reiffel. Although Richie Richardson scored a century in the first innings, this was overshadowed by the Waugh brothers – Mark made 126 while Steve scored 200; together they shared a 231-run fourth wicket stand to push Australia to a formidable total. The West Indies were dismissed without reaching Australia's first innings total, with Reiffel and Shane Warne taking four wickets each, and the trophy went to Australia for the first time since 1976. Australia made it back-to-back series wins with a 3–2 victory in 1996–97, yet could only draw the series in the West Indies in 1998–99. However, the 2000–01 series saw the emergence of a commanding Australian Test team, who would go undefeated against the West Indies to the present day. That series saw the Australians whitewash the Caribbeans, winning 5–0, the first such result since the West Indies toured Australia and New Zealand in 1930–31. The defeat was unsurprising; the West Indies had been whitewashed in their previous three Test series, in Pakistan, South Africa and New Zealand. Australia took the 2002–03 series 3–1, and won the following six series without losing a Test, including two more whitewashes in the 2005–06 series and 2015 series. Overall, Australia have won 47 of the 101 Test matches played for the Frank Worrell Trophy, with the West Indies winning 30. Brian Lara is the trophy's top scorer. Mark Waugh is the most successful fielder in the history of the trophy, with 45 catches. – one Test match was tied. ^ a b c d e f g h i j "Records / The Frank Worrell Trophy / Series results". ESPNcricinfo. Archived from the original on 23 November 2016. Retrieved 6 June 2017. ^ "Captain extraordinaire". ESPNcricinfo. Retrieved 6 June 2017. ^ a b Chowdhury, Saj (2 April 2003). "Legend behind the Worrell Trophy". BBC Sport. Retrieved 6 June 2017. ^ "Obituary – Ernie McCormick". Wisden Almanack. 1992. Retrieved 6 June 2017. ^ a b "The tied Test film: A fitting tribute". National Museum of Australia. Retrieved 6 June 2017. ^ "Draw in Sydney but Australia retain Frank Worrell trophy after Warner's ton". The Guardian. Reuters. 7 January 2016. Retrieved 6 June 2017. ^ a b Gopalakrishnan, Akshay (29 December 2015). "Infographic: Frank Worrell Trophy before and after Waugh twins". Wisden India. Archived from the original on 11 March 2017. Retrieved 6 June 2017. ^ "Records / The Frank Worrell Trophy / Most catches". ESPNcricinfo. Archived from the original on 14 August 2018. Retrieved 6 June 2017. ^ "Records / The Frank Worrell Trophy / Most dismissals". ESPNcricinfo. Archived from the original on 14 August 2018. Retrieved 6 June 2017. ^ Cozier, Tony (12 July 2015). "A series greater than the 2005 Ashes?". ESPNcricinfo. Retrieved 6 June 2017. ^ a b "Legends recall classic Test". BBC Sport. 20 November 2000. Retrieved 6 June 2017. ^ Ryder, Rowland. "The glorious uncertainty". ESPNcricinfo. Retrieved 9 July 2017. ^ Coverdale, Brydon (4 August 2011). "'The most incredible game'". ESPNcricinfo. Retrieved 6 June 2017. ^ a b "The Frank Worrell Trophy 1964/65". ESPNcricinfo. Retrieved 6 June 2017. ^ a b "The Frank Worrell Trophy 1975/76". ESPNcricinfo. Retrieved 6 June 2017. ^ Mallett, Ashley (30 January 2013). "Shine on me, Roy". ESPNcricinfo. Retrieved 6 June 2017. ^ "Australia tour of West Indies, 2nd Test: West Indies v Australia at Bridgetown, Mar 17–19, 1978". ESPNcricinfo. Retrieved 6 June 2017. ^ "Australia tour of West Indies, 4th Test: West Indies v Australia at Port of Spain, Apr 15–18, 1978". ESPNcricinfo. Retrieved 6 June 2017. ^ Toohey, Peter. "Rumble in Jamaica". ESPNcricinfo. Retrieved 6 June 2017. ^ a b "The Frank Worrell Trophy 1983/84". ESPNcricinfo. Retrieved 6 June 2017. ^ a b "The Frank Worrell Trophy 1984/85". ESPNcricinfo. Retrieved 6 June 2017. ^ "Curtly's seventh heaven". ESPNcricinfo. Retrieved 19 July 2017. ^ Oliver, Scott (4 June 2015). "'Going to Perth in '93, we just knew we were going to win'". ESPNcricinfo. Retrieved 19 July 2017. ^ "Australia tour of West Indies, 1st Test: West Indies v Australia at Bridgetown, Mar 31 – Apr 2, 1995". ESPNcricinfo. Retrieved 6 June 2017. ^ Reiffel, Paul. "We'll take it from here". ESPNcricinfo. Retrieved 19 July 2017. ^ Selvey, Mike (11 July 2010). "A fiery beginning to the end of an empire". ESPNcricinfo. Retrieved 6 June 2017. ^ "Australia tour of West Indies, 4th Test: West Indies v Australia at Kingston, Apr 29 – May 3, 1995". ESPNcricinfo. Retrieved 6 June 2017. ^ a b Croft, Colin (6 January 2001). "Australia deserve 5–0 success". ESPNcricinfo. Retrieved 6 June 2017. ^ "Records / The Frank Worrell Trophy / Result summary". ESPNcricinfo. Archived from the original on 1 December 2017. Retrieved 6 June 2017. ^ "The Frank Worrell Trophy 1960/61". ESPNcricinfo. Retrieved 6 June 2017. ^ "The Frank Worrell Trophy 1968/69". ESPNcricinfo. Retrieved 6 June 2017. ^ "The Frank Worrell Trophy 1972/73". ESPNcricinfo. Retrieved 6 June 2017. ^ "The Frank Worrell Trophy 1977/78". ESPNcricinfo. Retrieved 6 June 2017. ^ "The Frank Worrell Trophy 1979/80". ESPNcricinfo. Retrieved 6 June 2017. ^ "The Frank Worrell Trophy 1981/82". ESPNcricinfo. Retrieved 6 June 2017. ^ "The Frank Worrell Trophy 1988/89". ESPNcricinfo. Retrieved 6 June 2017. ^ "The Frank Worrell Trophy 1990/91". ESPNcricinfo. Retrieved 6 June 2017. ^ "The Frank Worrell Trophy 1992/93". ESPNcricinfo. Retrieved 6 June 2017. ^ "The Frank Worrell Trophy 1994/95". ESPNcricinfo. Retrieved 6 June 2017. ^ "The Frank Worrell Trophy 1996/97". ESPNcricinfo. Retrieved 6 June 2017. ^ "The Frank Worrell Trophy 1998/99". ESPNcricinfo. Retrieved 6 June 2017. ^ "The Frank Worrell Trophy 2000/01". ESPNcricinfo. Retrieved 6 June 2017. ^ "The Frank Worrell Trophy 2003". ESPNcricinfo. Retrieved 6 June 2017. ^ "The Frank Worrell Trophy 2005/06". ESPNcricinfo. Retrieved 6 June 2017. ^ "The Frank Worrell Trophy 2008". ESPNcricinfo. Retrieved 6 June 2017. ^ "The Frank Worrell Trophy 2009/10". ESPNcricinfo. Retrieved 6 June 2017. ^ "The Frank Worrell Trophy 2011/12". ESPNcricinfo. Retrieved 6 June 2017. ^ "The Frank Worrell Trophy 2015". ESPNcricinfo. Retrieved 6 June 2017. ^ "The Frank Worrell Trophy 2015/16". ESPNcricinfo. Retrieved 6 June 2017. Wikimedia Commons has media related to Frank Worrell Trophy. This page was last edited on 2 April 2019, at 09:27 (UTC).